In a large skillet over medium heat, heat oil. Add rosemary and fry for about 1 minute, or until the leaves are crispy. Use tongs to pluck the sprigs out of the oil and place on a paper towel. When cool enough to handle, pull the leaves from the sprigs. Add the onions and 1/4 teaspoon of the salt to the skillet and stir to coat. Cover and let cook, undisturbed, for 7 to 8 minutes, until they start to soften. Remove the lid and continue to cook until softened and caramelized, stirring occasionally, 7 to 8 minutes more. Remove from the heat and stir in the rosemary leaves. Preheat the oven (with the oven rack in the middle) to 400°. Shape the beef into 4 patties about 3/4″ thick. Sprinkle both sides with pepper and the remaining 3/4 tea­spoon salt. Transfer the burgers to a rimmed sheet pan. 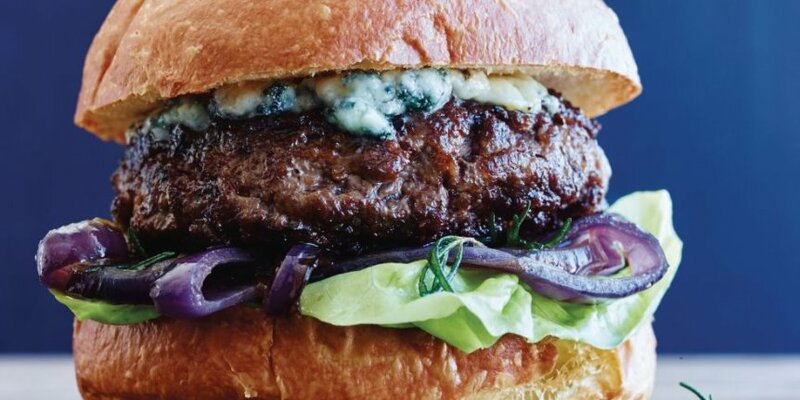 Dividing evenly, crumble the blue cheese over each burger. Bake until the cheese melts, 2 to 3 minutes. Warm your buns at the same time. Build your burgers with the buns, patties, lettuce, caramelized onions and rosemary.